It’s early spring. This means about a month of freeze and thaw, rain and snow, optimism and pessimism. It takes a long time. It’s a process, and the progress within the process is incremental to say the least. For instance, today I saw a trout rise to eat a black stone but had a heck of a time getting a fish to chase a streamer. One angler catches a bunch of trout on a nymph, another gets skunked. There have been some off days and some on days. Some people’s off days were other people’s on days. That’s how it is in the spring. 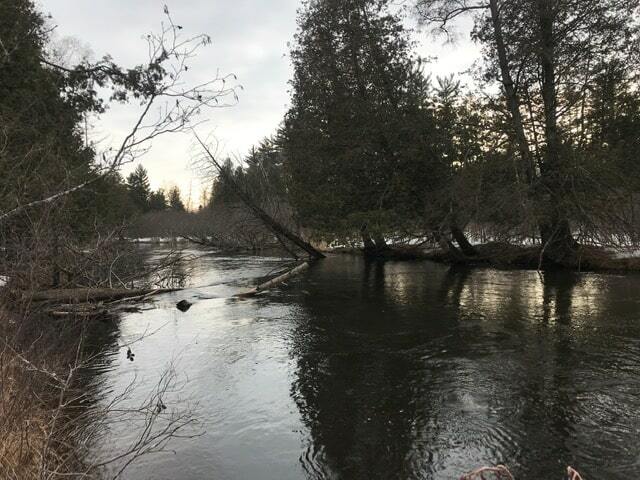 Folks have been really mixing it up and the trout have been in a variety of moods depending on time of day, stretch of river, overnight temps, and cloud cover. There are a lot of variables. The weather has been changing by the day. The nymph fishing has been pretty good on some days and that has been the most consistent technique. 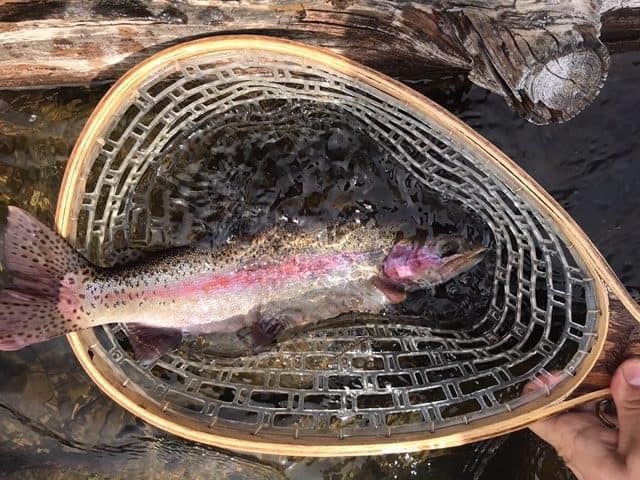 The upper river — mostly the mainstream — is seeing its normal run of rainbows. They should start making beds here over the next few weeks. Right now there is always the outside chance that the pool your fishing has a big fat rainbow in it…or maybe a few of them. Because of this, I put a little bling in my nymph set-ups. Could be an egg, or a pink bead anchor fly, or peach colored scud. Rainbows like a little jewelry. With the warmer afternoons and the increase in bug activity (midges, black stones) the trout are spread out a bit more and the nymph angler doesn’t need to only fish the pools. Thigh deep runs with a good seam will have a few trout in them. On the nice warm days, the trout will move right to the lip of the drop-offs and will eat pretty well. Our waders are covered with nymphs in the afternoons. The trout have gone from survive to thrive. They are firm-feeling and cold when you hold one. The upper rivers are running clear and relatively low considering the snow we’ve lost and the warmer temps. This is a good thing. The river below the confluence of the South Branch is stained red and will, on the warmer days, turn a glacial green, which in my experience is a bad thing. All that said, I still like the low water when the water temperatures are cold, and I think the change in weather toward a nasty weekend (this weekend) will probably make for some pretty good streamer fishing. We’ve been using a variety of colors but my general rule for spring is clear water = black, dirty water = everything else. There are a few more accesses open to vehicles with AWD and ground clearance but in general it’s very easy to get stuck right now. We had four trucks stuck at once at the Stephan boat launch this past Sunday. It must have been quite the sight! We’re looking forward to a great weekend, and the weather forecast has improved greatly. We’ll have the coffee hot, food in the restaurant, sales in the fly shop, tying in the board room, nymph class in the river, all going pretty much simultaneously on Saturday. It’s gonna be fun, and it only feels right to celebrate the beginning of a new fishing season by going fishing. Free Fly Tying Saturdays, this Saturday, March 30: We’ve taught dozens of people how to tie flies at these free sessions, and many are now very proficient fly makers. We have a wide selection of materials, vises and lamps. Don’t have any fly tying stuff? Just come. Have everything under the sun? Bring it. We’re back in the Board Room this year, so you can grab breakfast in the restaurant before we start tying! We have no agenda at these sessions. If you want to work on comparaduns, we’ll be there to help. Our goal is to help you learn to tie what you want to tie. Free chili and a warm fire. We have limited space, first come first served. 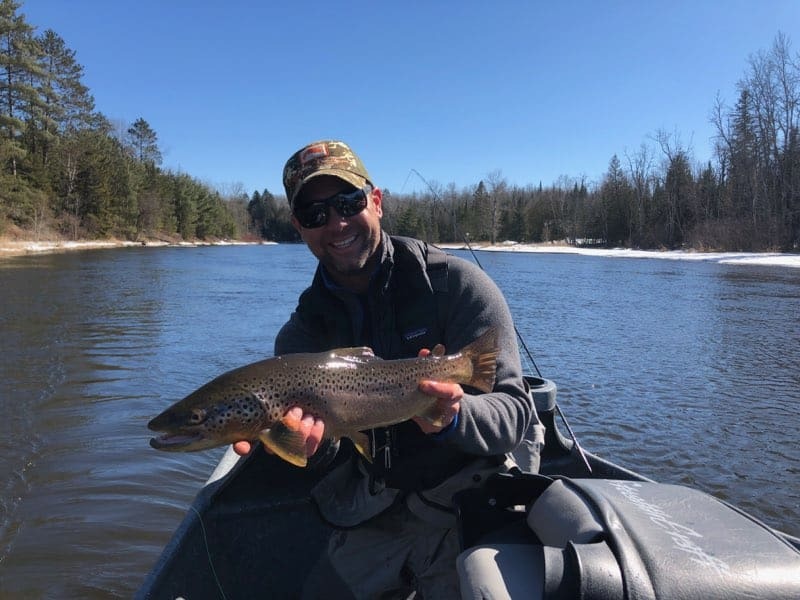 One spot just opened up for…Tying Terrestrials with Dennis Potter, this Saturday, 5 pm – 10 pm: This special class is for moderate to experienced tyers that want to learn some of the best Au Sable (and beyond) terrestrials. We think Dennis’ flies are some of the cleanest you’ll see anywhere, and we’re proud to sell a ton of them thru the lodge, tied by Dennis himself. You’ll learn the Fathead Moth, Robber Fly (pictured) and more. This class is not just a pattern class…you’ll learn the techniques to improve your tying across a multitude of patterns. Dennis will be bringing his own 4k video equipment offering unparalleled visual clarity. This class kicks off with five pm dinner, and participants can expect to tie until 10 pm. All materials are included. We ask folks to bring their own lights and tools. The cost of this class is $85/person which includes dinner and drinks.